I t is mid-morning in Cusco Peru and the train station is surprisingly relaxed, as today I wait to board the new Belmond Andean Explorer luxury train. This train differs from the previous service in that it is now an overnight sleeper service, which commenced service on May 4th 2017. Today’s journey called The Spirit of the Water will take me South from Cusco along the spine of the Andes Mountains to the city of Puno, culminating in an overnight stop alongside the famed Lake Titicaca. 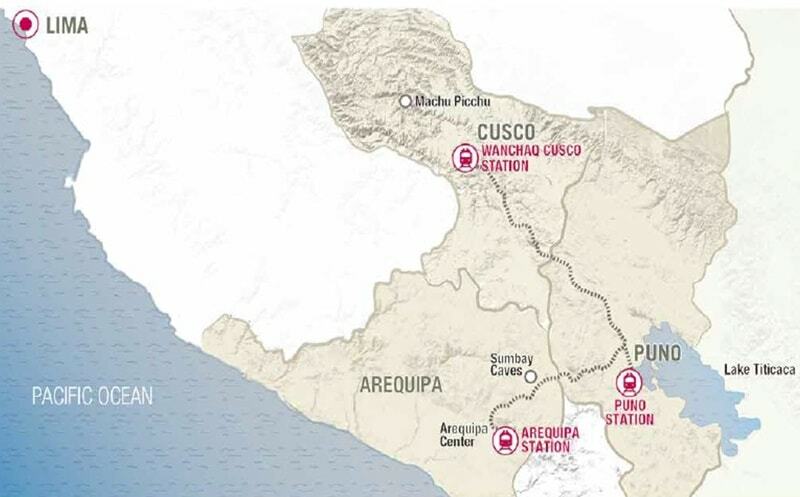 The Belmond Andean Explorer luxury train also has a number of other services based around the longer journeys of Cusco- Puno- Colca Canyon- Arequipa which run in both directions. On the platform as passengers await, a local Andean music group serve entertainment in the form of Huayno dancing on the platform much to the enjoyment of onlookers. The whole boarding and registration process is all done in an unhurried manner and already the staff begin to know passengers by name. At capacity, there are 48 passengers and so staff outnumber them; a true reflection of the attention to service which this train affords. The train looks graceful and elegant in its navy blue and grey livery, as personnel add the finishing shine to the ornate brass work and fittings. The train began life as the Great South Pacific Express in Australia which operated until 2003. 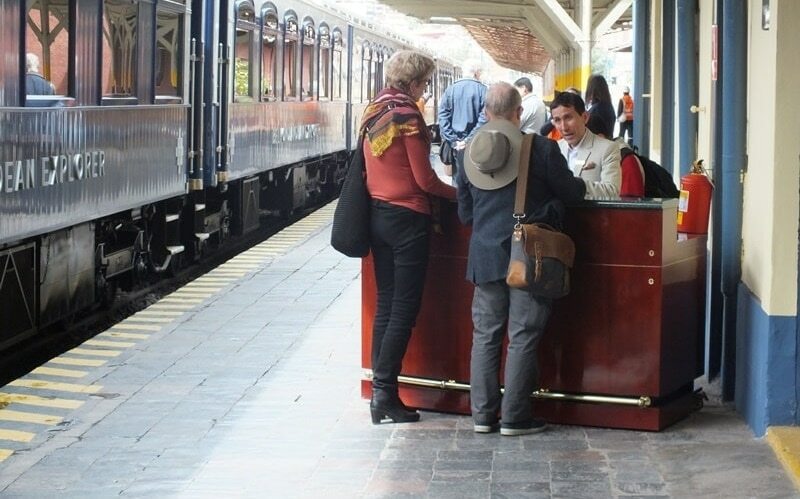 In 2016, the carriages were shipped to Cusco to receive a refurbishment of much Andean influence, in both design and fitment. 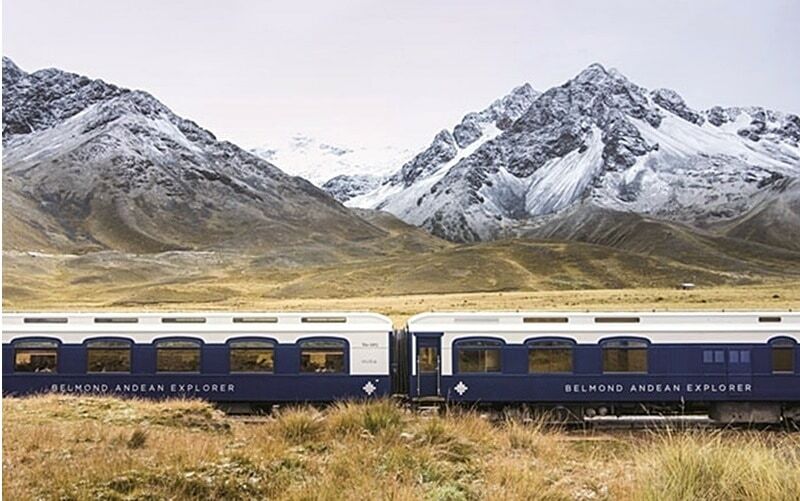 The new Belmond Andean Explorer luxury train runs with 16 carriages, which consist of: one observation deck, two restaurant carriages, one bar/ lounge, spa carriage (which was not included on my journey) and eleven sleeping carriages. 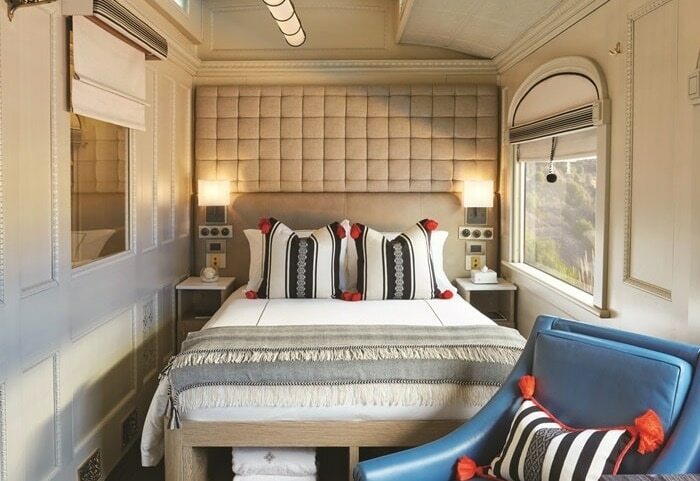 The sleeping carriages have four levels ranging from Bunk Bed, Twin Bed, Junior Double Bed Suite and culminating in the De Luxe Double Bed Suite. 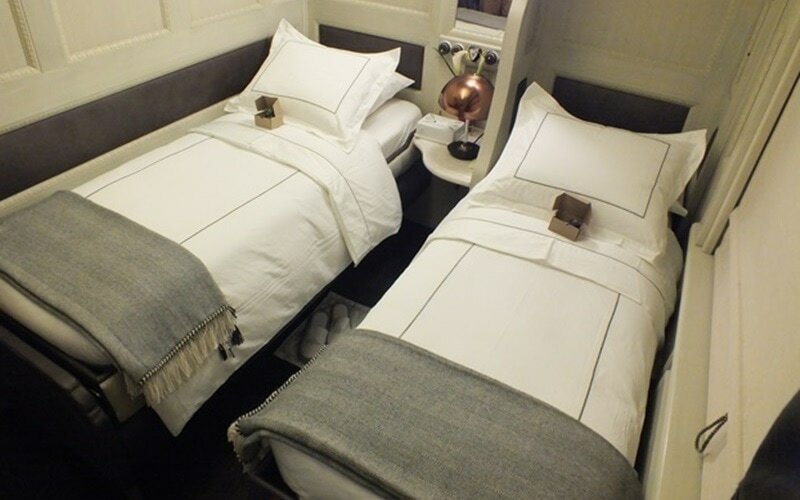 The twin cabin option has two small beds which by day are in a couch style and by evening the staff provide a turndown service to convert them to their sleeping arrangement. 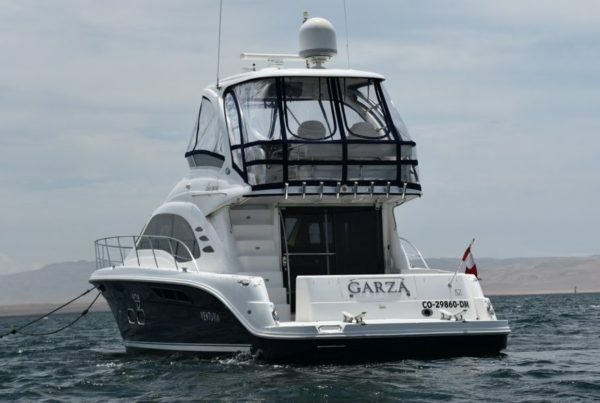 Prices on this Spirit of the Andes trip for range from $480 to $695, double occupancy per person sharing. All children over 3 years pay a full adult rate. On boarding we are greeted by Javier Carlavilla, Chief of Luxury Trains at Peru Rail, whilst enjoying a champagne reception and introductory information session of the train’s facilities. The interior is lavishly appointed by exquisite décor and the finest of soft furnishings. As we depart Cusco we roll out of the suburbs straddling the Huantay River. The views gradually change from the sprawling city to the agricultural altiplano. Here Andean people work in a harsh environment to eke out a living from these highlands. In the first hour of the journey, most people choose to walk about to get familiar with the train. I find the journey back to my cabin is a considerable walk, as the narrow aisles allow only single passage. Throughout the journey beverages are available from the free bar and also the staff provide excellent personal attention to passengers. Back on board, we are treated to warming evening cocktails which include the ubiquitous Peruvian Pisco sour. Made with native Pisco liquor and created with lime juice, syrup, egg white and Angostura bitters with crushed ice. 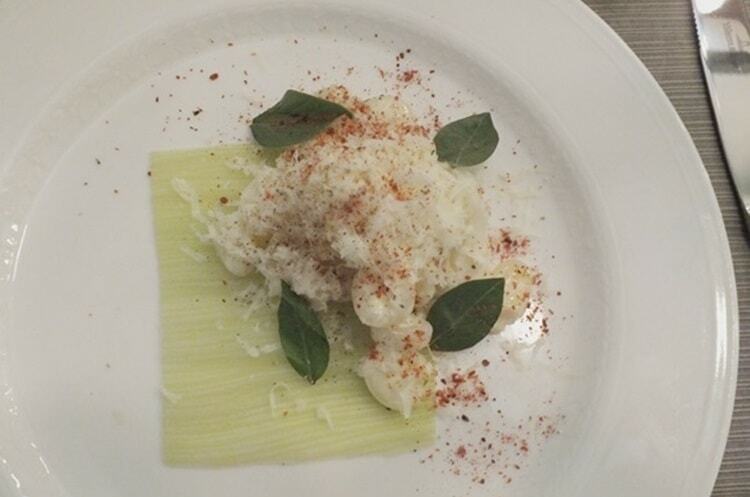 At 12.30 lunch is served in the restaurant cars, which included Andean cheese with giant corn followed by a fillet of sea bass with muña scented broad beans, citric yoghurt and onion broth. 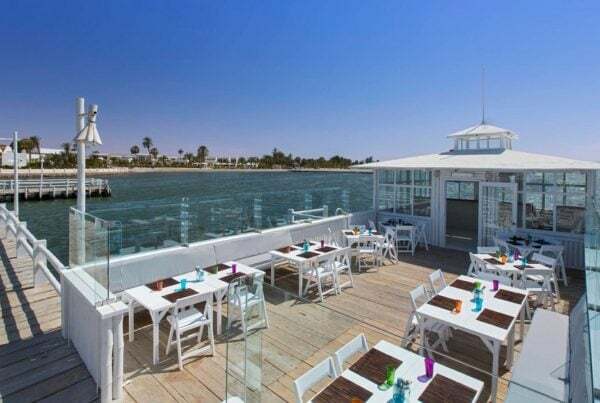 All culinary creations on board are inspired by award winning Peruvian chef Diego Muñoz. 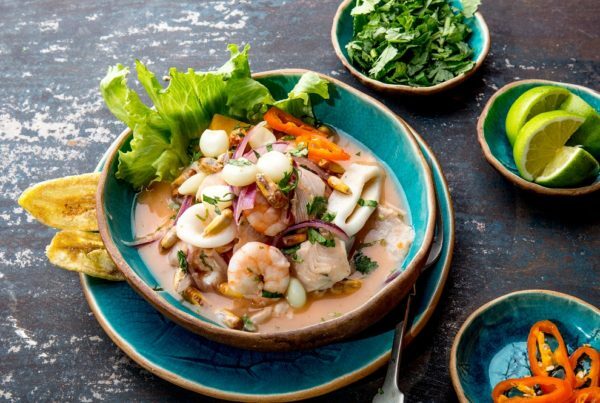 He has endeavored to highlight the diversity and richness of Peruvian cuisine by including fish from both Lake Arapa and the coast of Moquegua complimented by pulses from Cusco. 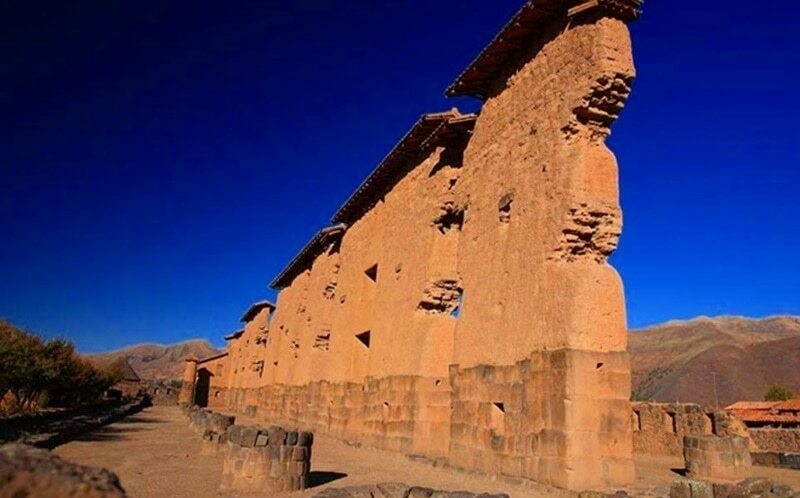 After lunch, we reach the settlement of Raqchi, 3,480 meters high, which contains the Temple of Wiracocha. A bus is provided for the 10-min drive to the ruins, where our guide David gave an excellent talk on the importance of this site, as a strategic fortress of both military and food storage for the Inca people. The site is pre- Inca but dominated by the towering Inca Temple of Wiracocha and outlying 152 qullqa storage huts. Back on board, afternoon tea is served with a selection of cakes and passengers have time to enjoy the observation deck and get to know their fellow travellers. This is a slow travel, and so passengers have time to absorb the landscapes and also enjoy meeting new friends on a common shared experience. There is no Wi-Fi, and that’s to be applauded as it encourages travellers to reach out and share life stories. As we venture up the valley toward the pass at La Raya the low evening sun transforms the sky from blue to amber hues, as we stop at 14,150 feet above sea level. We disembark to take in the scenic Andean panorama and visit a small market where hardy Peruvian souls sell their colorful garments and souvenirs. The mountain air holds a chilling breeze but the views more than compensate. Back on board, we are treated to warming evening cocktails which include the ubiquitous Peruvian Pisco sour. Made with native Pisco liquor and created with lime juice, syrup, egg white and Angostura bitters with crushed ice. Following our drinks lunch begins at 7p.m. and consists of a consommé of alpaca tortellini, with sprouts, and a main course of duck breast with Urubamba Valley beetroot, served glazed in elderberry, wheat and duck sauce. The night falls in as the train carries us through the market streets of Juliaca, an unappealing city by any standards. At the open observation car, you can feel intimidated by the dilapidated surroundings outside; but equally you may feel a buzz from the precariousness of your location. We rumble on down to reach Puno and the train stops in the station and gradually passengers retire to their sleeping quarters. I am last to reach my twin cabin and settle down, the beds are small, and large people will have a problem. I spent over an hour trying to get to sleep and suddenly I was awoken by a lurch of the train, and we were back in motion. We moved for 20 minutes, further down to the dock area beside Lake Titicaca. I try to rest again but it’s fruitless and this has spoiled a good ending. Next morning guests can see the sunrise at 5.15 a.m. or sleep until 7 a.m. for to have breakfast on board. Trips to the islands of Uros and Taquile are offered for $177 after which passengers can return for the onward journey to Arequipa. My journey concludes at Lake Titicaca and I try to evaluate this journey. This service is new and has teething problems such as this double stop in Puno. In addition, I would recommend people to pay more and get a Junior or De Luxe Cabin for two reasons. Firstly, a better bed and secondly, these carriages are better located for access nearby to the bar and restaurant. The Spirit of the Andes ending in Puno is somewhat of a letdown, unless you have plans to visit the islands. Puno has a pretty Plaza de Armas but go a block or two away and you find yourself in dubious surroundings. To avoid staying in Puno too long it is best to have pre-arranged your onward travel; custom travel itineraries are available from the Luxury Peru Vacations experts at TLA Travel. 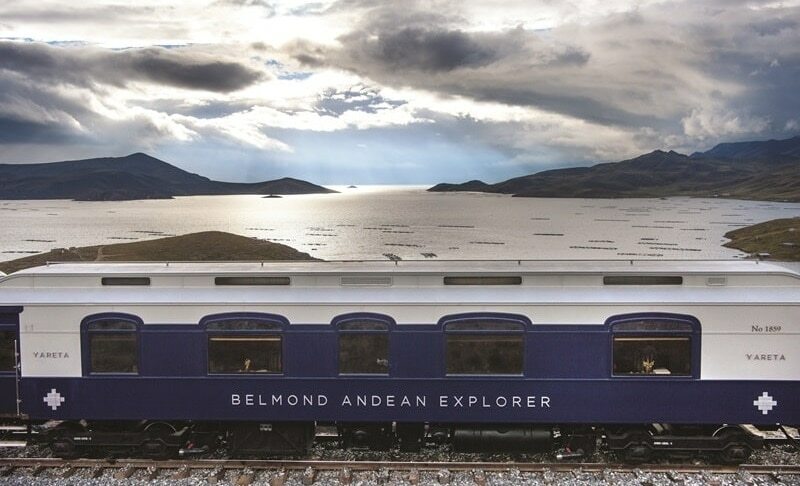 Even with these problems, the Belmond Andean Explorer luxury train is still a 1st class service, with wonderful attentive staff that make this journey a once in a lifetime experience. This service will contribute to the renaissance of rail.